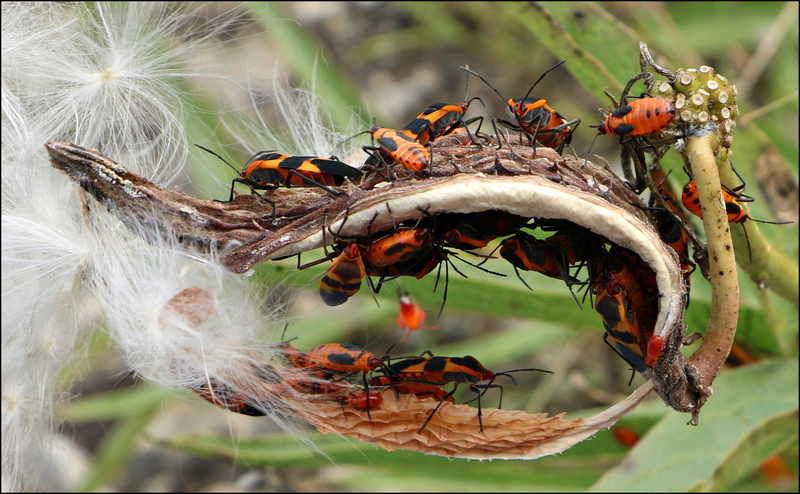 The large milkweed bug, Oncopeltus fasciatus, feeds on the seeds, leaves and stems of assorted milkweeds. Here, at least three instars, or developmental stages, of the bug have gathered on Asclepias asperula, the antelope horn milkweed: adults, near-adults with little black wing buds, and the very small, mostly orange nymphs. Milkweed bugs not only resemble monarch butterflies, they’re just as distasteful to predators because of toxic compounds contained in the milkweed sap they ingest. The easily recognizable orange-and-black color scheme common to these nasty-tasting insects, called Müllerian mimicry after German naturalist Fritz Müller, offers the bugs a degree of protection. Their annual migration south is triggered by shortening day length, cooling temperatures, and declining quality of milkweed plants as food. Titers of a glandular product called juvenile hormone signal the milkweed bug’s ovaries to take a “time-out”, and trigger flight behavior that transports the milkweed bug to warm southern lands where milkweeds grow. Once the southward migration is complete, juvenile hormone levels rise, ovaries are switched on, and reproduction resumes. In spring, the migratory pattern reverses and generations of large milkweed bugs leap-frog their way northward to colonize milkweeds as far north as Canada. Clearly, the milkweed bug needs a better press agent. Its migratory habits are fully as impressive as those of the monarch, but most people tend to prefer a butterfly over a bug. Still, milkweed bugs, interesting and handsome in their way, are worth seeking out where autumn milkweed continues to thrive. Now this is interesting. The little boogers. Also an interesting photo. Very nice Linda. I was tickled to find so many generations mingled together on the same plant. I’ve grown accustomed to seeing a few adult bugs on a plant, but I’d never seen anything like this. I thought it was interesting that they develop “wing buds,” and then the fully formed wings.You can see the developing wings best on the bug on top of the plant, at the far right. Yes and thanks for pointing it out. We all practice a bit of insect prejudice, I fear. Butterflies are pretty, milkweed bugs, maybe not as much–but they’re mighty impressive! I didn’t know about the migration pattern, but it makes perfect biological sense. When I first started photographing flowers, I had no idea how many insects I’d find hidden among them. I expected butterflies and bees, but the sheer variety of bugs, beetles, spiders, flies — there seems to be no end to it. What I have found is that the “ick factor” decreases substantially as I learn about these little marvels. The thought that these insects — any insect — migrates was something I’d never contemplated. That’s so true! I’ve been amazed at what’s out there and mostly, they do their thing, I do mine and the plants aren’t bothered much, if at all. And you’re also right about the ick factor–I’m not fussed about any of the creepy-crawlies. As long as I don’t cross paths with one of those long, fat, millipedes, I’m good. Thank you, Dina. It’s an interesting photo, but I’m not sure it’s competition ready! I do like the funny, expandable pleats at the bottom of the pod. 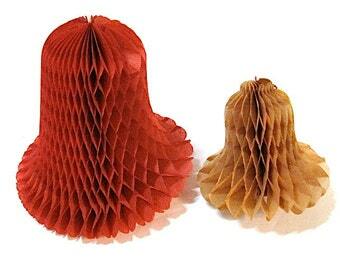 They remind me of the vintage Christmas decorations we used to hang. Speaking of decorations, orange lights seem to be all the rage now for Halloween. Wouldn’t it be great if someone turned these bits of orange and black into Halloween decorations? I suppose the market for them wouldn’t be too large, although they might sell in the entymology departments of universities. Monarch butterflies just migrated through Marathon two weeks ago…must admit, I enjoyed that migration a bit more than milkweed bugs. Thanks for the great photo and the always anticipated posts. It’s good to hear your report. I’ve seen photos from Sea Rim State Park and Palacios that showed large groups resting on bushes and such. They’ve been passing through here in pretty good numbers, but they didn’t linger. They probably were on their way to your house. I’ll say this in the bugs’ favor — they’re much easier to photograph than butterflies. As many years as I’ve been observing these bugs, I never knew about their monarch-mimicking migration. You’ve done us a service in pointing it out. I imagined the bugs inside the oval of your milkweed as running the kind of treadmill we often see pictures of a mouse on. Their migratory behavior certainly was a surprise to me. The complexity of the biological changes that take place to keep them from reproducing until they reach the warmer climes is fascinating. I’m sure it’s been studied, with a paper or two (dozen) that lays it out in even greater detail. Your image of a treadmill’s a good one. That’s exactly what it looks like: except a mouse couldn’t run upside down. I never would have thought that a little bug like that would be capable of such a migration! I suspect their technique is to make the trip in small increments: leaving an area where milkweed is on the decline, going just far enough to find a good food source, and then feeding until less light and cooler weather triggers them again. I was wondering today whether they lag behind the monarchs. I suspect they do. The next time I get out, it will be interesting to see if I find any. I’ve been watching these guys for a couple of weeks on the milkweed by my back porch without knowing a thing about them. Thanks for the nature lesson. I remember you mentioning your milkweed. It’s great that you have some of these, too. The big surprise for me when I found this group was the presence of the nymphs: the newly-hatched ones that are almost pure orange. What I don’t know is why this group was so large. There was plenty of milkweed around, so they didn’t need to cluster in order to find food. So many mysteries, so little time! I guess I’m guilty of preferring Monarch butterflies to milkweed bugs, Linda! This was a fascinating glimpse into these critters, though. Isn’t it grand how clever Mother Nature is in preserving species?! Who’d think itty-bitty bugs like this could migrate hundreds of miles twice a year?? I need to do some more research, Debbie. On the one hand, I’ve read in many places that they cover significant distances in their migration, but on the other hand, their adult life span is about a month. I suspect that means that a single insect doesn’t make a round trip. In the fall, for example, adults may fly south, mate, and then die, leaving the next generations to make the trip north. What’s certain is that the whole process is amazing — there’s a lot going on in the world that surrounds us! Bravo! You’re being a wonderful advocate for the small and misunderstood creatures of this world! A great photo worthy of any nature competition. Thanks for the kind words about the photo, eremophila. My great regret is that I didn’t get a clear, crisp photo of the single milkweed bug I found early one morning doing what appeared to be calisthenics on a milkweed plant. He had his wings spread the whole time, and they really were quite beautiful. But he was less than a foot off the ground, and moving around a good bit, and I’m not as limber as I used to be. One of these days I’ll post one from that series, just because they’re so unusual — and in at least one case, darned funny. Müllerian mimicry. Myriad metamorphic milkweed bugs, mottled and molting, migrating like Monarchs. Mmmmmmm… And there’s yet one more: the milkweed leaf beetle. The beetle’s a mimic, too, but it’s Batesian mimicry: no bad taste, just the orange and black color scheme that functions as a warning. The beetles are cute. I don’t think I’ve ever seen one, but I’ll be on the lookout now. They do look rather pretty. If they are distasteful, have no fear, I won’t try them out on my toast. They do look as if they might have pharmaceutical qualities about them. Very often the very toxicity of plants and insects are eagerly studied for compounds that might be beneficial to mankind. You’ve reminded me that Annie Dillard once wrote about an entymologist who tested out the theory that monarchs taste bad by actually tasting some. According to him, they tasted rather like dry toast. I’m with you; I’ll not be tasting either the butterflies or the bugs, although it would be interesting to know what they taste like to their predators. I’ve yet to meet a milkweed bug that talks, so we’ll probably never know. When I first started paying attention to these smallest among us, I was surprised to find that insect scientists categorize things just as flower people do. They call a butterfly an insect, but not a bug. On the other hand, they also categorize the ladybug as a beetle. For me, “ladybeetle” just doesn’t have the same ring to it. It seems the scientists are willing to acknowledge the limits of scientific nomenclature, though, since the big citizen science project centered on the creatures is called The Lost Ladybug Project. But your point’s right on. We love the colorful and fluttery, and turn away from the squirmy, the leggy, and the blob-ish. I certainly used to be in the ranks of the “see spider, smash spider” crew, but that’s over with now. You’d have a lot to admire on the boats right now; spiders of every size are rampant. They’re smarter than the love bugs, that’s for sure. In a quarter-century, I’ve never found a spider in my varnish. You’d think an occasional jump might end badly, but apparently not. What an amazing distance they travel (for such a small bug). Somehow, I’ve always had the idea that insects are born, live their allotted span, and die — all in the same neighborhood. Monarchs and other migrating butterflies seemed like outliers, but that clearly isn’t true. As a matter of fact, the meteorologists I follow sometimes post radar images of traveling insects as well as the more common images of bats and birds. One of the predictable examples is the mayfly hatch along the Mississippi river. I’ve never caught insects in real time, although I have seen bats and migrating raptors. It’s good to learn about yet one more degree of mimicry. That could just as easily describe the large milkweed bug, and it might even explain my discovery of large clusters of bugs in every stages of development. I mentioned the milkweed leaf beetle in my comment to Rob. I can’t quite get over the fact that the large milkweed bug is an example of Müllerian mimicry, while the milkweed leaf beetle engages in Batesian mimicry. For that matter, I can’t quite get over the fact that I couldn’t have described either kind of mimicry when I took the photo. You’re right: I intended this as a continuation of our conversation above, but I must have clicked in the wrong place. Now I’ll have to be on the lookout for the adult beetle. It’s interesting that you found the larva on a vine. I came across this page that shows the beetle absent in my area, but present in yours. It says that, in central Texas, the major host plant is talayote, or Cynanchum unifarium, a vining plant in the milkweed family. There are some good photos of talayote here. I looked on your site, but it seems you’ve not posted a photo of the plant there. It’s interesting that the odor you mentioned mimics that of the pearl milkweed vine. These are gorgeous bugs but I’ve never seen them on my Michigan milkweed. Wish I could. They’re so pretty! They are pretty, and they don’t do any particular damage to the plants.They’re listed as one of the true bugs that inhabit Michigan, so you may see them on your plants now that you’ve seen them here. That happens to me frequently. I’ll look at a flower that’s new to me on someone’s site and say, “Oh, that doesn’t grow here.” Then, I go out, take a look around, and find dozens of them staring me in the face. It’s amusing as can be, and proof that “seeing” is more complicated than just having 20/20 vision. Linda, your image is extremely sharp and detailed. Which ISO and shutter speed did you use for this detailed shot? You certainly have a steady hand for these fellows. I wish I could be so steady with my 70-300mm lens. Because of Hurricane Harvey and other issues, I went for a long time without being out and about, and I’m having to redevelop the strength to use it. Apparently my sanding muscles are different from my camera-holding muscles. I was happy with how well this came out. The settings were aperture priority, f/8, 1/100, 42mm. What a fun photo, and lots of facts I didn’t know – the migration, and even the mimicry – I hadn’t thought about the color similarity to Monarchs. So…if I put together an outfit in those colors, with bold contrasts, will predators leave me alone? Well, we already have “Red and yellow, kill a fellow; red and black, friend of Jack.” We could add, “Orange and black, repel attack.” This much is sure — if it worked for humans, you’d be a rich woman in no time, with a clothing line that would be something to see. It has surprised me to learn how many creatures sport orange and black. 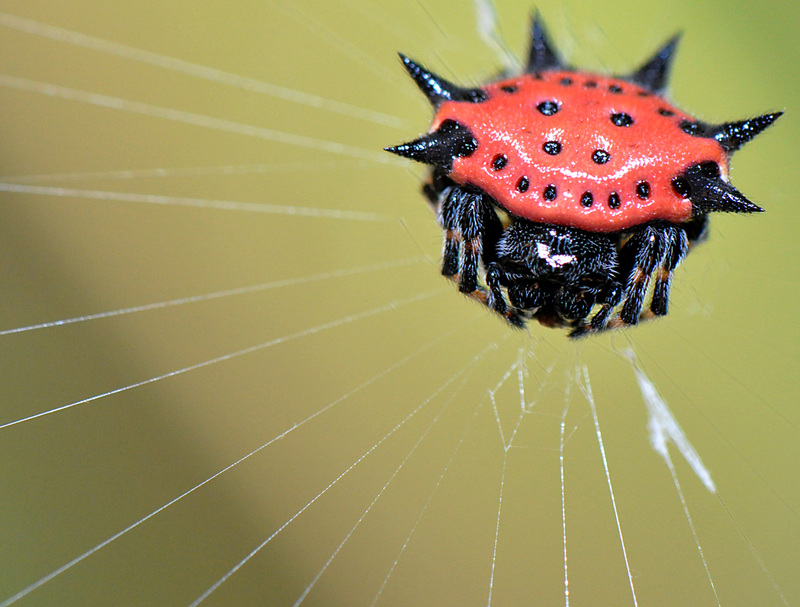 There are birds, caterpillars, and the wonderful spiny orb weaver. Halloween’s traditional orange and black colors may be rooted in nature, after all. Wed AM – Oh my! I traveled to Guayaquil and back yesterday and stopped to use the public wifi at a park last night before resuming the last leg of the journey. I am now home, relaxed and reading posts in the offline mode. The thought of ‘an outfit in those colors’ to make ‘predators leave me alone’ made me laugh! I haven’t read Linda’s reply yet, as I had to stop and inject my instant reaction to your comment! It also triggered a memory from when I lived in Costa Rica. The open-doors and windows ‘bring the outdoors inside’ concept also brought many insects if one turned on a reading lamp at night. For pure whimsy, I painted oversized poison-dart frogs on one lampshade but later realized that the insects no longer came to that light. It didn’t work, however, in Ecuador! On to Linda’s reply …..
which made me smile as well! ‘Orange and black, repel attack!’ – oh yes! and I would love to own a flashy orange/black/white monarch-themed shirt or blouse or jacket! (I would probably refrain from purchasing the matching leggings!) But that would make a good ‘test’ – if the insects bit my legs, but not my torso, hmmm, I’d be a spokesperson for the new company! Great post, Linda; seeing the image of the opened pod sent me back to childhood years, and I could visualize the brambles along the fences where the vines presented the pods, plenty for grasping as I rode past on my horse then leaving the trail of fluff behind as I rode. I can almost feel the change of weather imprinted onto my memories of those seed pods in my hands – cold front moving in, and then the wonder, ‘What could I do with these pods?’ … Ah, nostalgia! The milkweed bugs remind me a lot of the cotton ‘stainers’ as well as the dangerous ‘Chagas bugs’ in Central and South America which transmit Chagas disease. I actually hit the road myself last weekend, which always throws me behind with everything here at home, including the blogs. I was so delighted to find this, and to see that you have a new post up. I finally have figured out why Guayaquil seems so familiar. It reminds me of one of our prescription drugs: Nyquil. Now I’m going to have to do a little search, to see if that *quil might be a Spanish suffix that the marketers picked up on for some reason. Do you know? Your comment about Costa Rica and bringing the outdoors inside reminded me of Liberia. At first, I didn’t live very easily with all the lizards that showed up, but then I discovered they ate even more unpleasant things that showed up, and things improved. I didn’t realize until I became interested in native plants that I never had seen a milkweed bloom. When I was growing up in Iowa, I never noticed the plants until the seeds formed and the pods burst open. Of course, that’s when they were fun for a kid: blowing the fluff around like dandelion heads, decorating the pods for Christmas ornaments or dried arrangements, and so on. After Harvey, there was a second flush of milkweed growth, and it was delightful to track a couple of species from tiny sprout to fully-blooming flower. Now, autumn is here, and slowly, slowly, all the color is disappearing — as it should. In time, the cycle will begin again, and I’ll be better prepared to enjoy it. i am in jama and about to check out of the hostal.. there’s a 3-plus hour ahead of me, but there are several stops to make between a and b… i hope that your day is a good one, spent in reflective and cherished quality time – or with friends and/or neighbors… i enjoyed explaining to my ecuadorian friends about ‘cornbread dressing,’ the only part of the traditional meals that i truly cherish – and miss! sometimes i make a batch of cornbread then make a skillet dressing, good enough to satisfy those moments of wistfulness for comfort foods!…. Safe travels — and I get it about the cornbread dressing. Some people have visions of sugarplums dancing in their heads. I have turkey and dressing, and if I have to choose, I’ll take the dressing. Share, we would! And when it came to the pie, we’d cling to that ancient wisdom: one cuts, the other chooses! :) i have a lemon-pie story to share with you one of these days.. when a good friend and i sat to enjoy a slice of pie around 3 in the morning on new-year’s eve. she’s now dead, and that story i treasure even more!